Miss Magooz Jewellery: Beautiful Beads! Hello everyone! Robin back to talk about some of Meghan's beautiful beadwork! Again, we had a jewelry party back on the 9th, so some of the pieces featured in these photos may not be available anymore, but if you see anything you can't live without, drop an email to missmagooz@gmail.com and you may just be able to have it set aside! 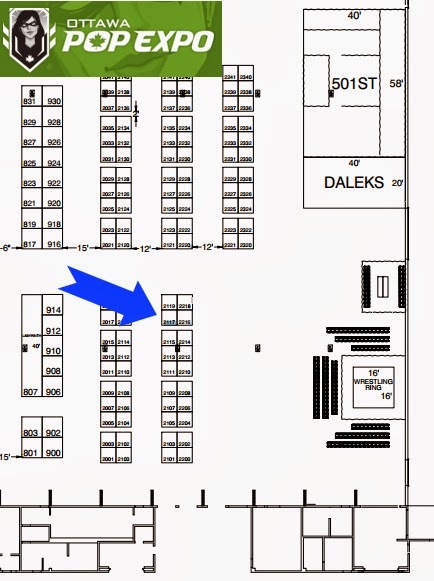 Our next show is Ottawa Pop Expo on December 7th and 8th at the Ernst and Young Centre near the Ottawa International Airport - come see us at booth 2117! 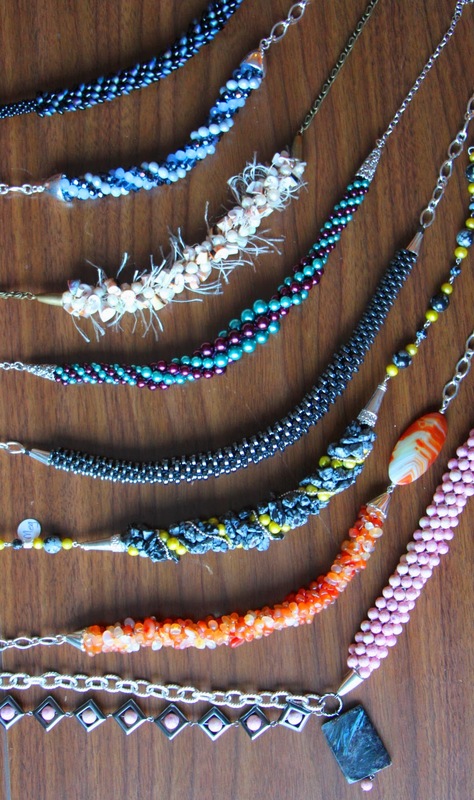 First up we have some awesome examples of peyote stitch! Peyote is an off-loom bead weaving technique done with needle, thread, and WAY more patience than I have at my disposal. Luckily, Meghan has a passion for it, as the result is always beautiful, and by varying the beads just a little, so many different and awesome designs can be made. The thickness of these bracelets make them a strong statement for your wrist, but most are made with very small beads, which makes them very light! Oh, and I know these fantastic bracelets are already featured in the cover photo above, but here's a closer look! On the top we have a lovely two-tone brown bracelet with a diamond pattern. Next, by adding drop shaped beads here and there in the pattern, the impression of "bubbles" are added all over this gorgeous silver bracelet. Speaking of gorgeous silver bracelets, the next piece down varies between different sizes of beads to make a fabulous accordion pattern! Next up, this beautiful turquoise piece uses metallic beads to contrast against matte for a unique pattern, and finally, two different shades of beads come together in a diagonal pattern in this lovely bracelet! The perfect accent for any ensemble! 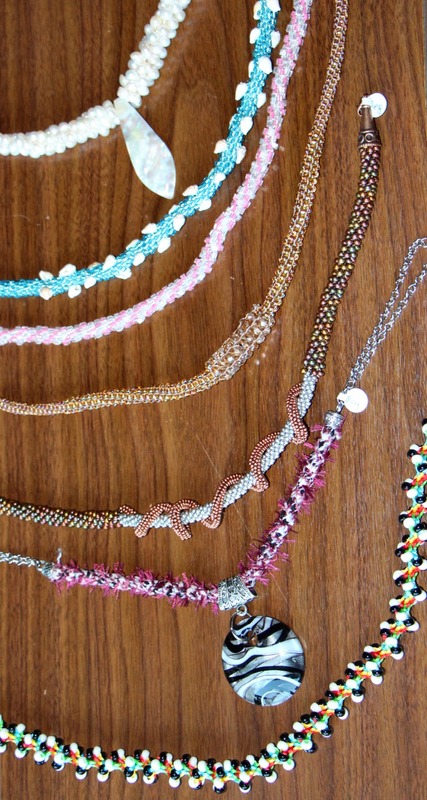 Another way to work beads into your accessories is with kumihimo! 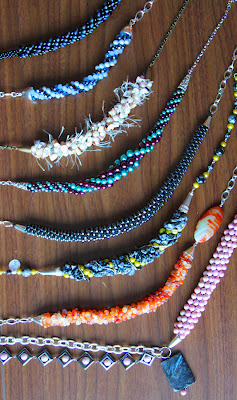 Meghan is a master of kumihimo, and has put together SO many different necklaces using the a wide variety of techniques to achieve different shapes, textures, and styles! Bear with me, because there are a LOT of them, a few of which you may have seen on here before, but I went a little crazy with the photoshoot! Top to bottom, we have a charming white fresh water pearl creation with a mother of pearl focal, followed by a beautiful beach inspired necklace with turquoise seed beads and small sea shells - makes you think of sandy tropical beaches! Next up, two kinds of clear beads, one lined with pink, are paired for a light, feminine piece. The following necklace uses a fantastic technique called inverse kumihimo, where the superlon which is normally hidden inside the beads is actually on the outside, adding to the texture of the piece! In this one, tan superlon is used with brown crystals, and larger crystals were used in the center for a focal! Here's where things get REALLY awesome! This fun and funky piece uses an extra kumihimo braid to add a spiral around another kumihimo core for a super unique look. Next, although there are no beads in it, fun, fuzzy cord is used to add some fluff to the cord, and a large bail suspends a bold focal in the middle! Finally, an awesome DNA inspired piece with silk cord and black and white beads for the science enthusiast in your life! Yes, there ARE more! Starting from the top again a beautiful two-tone black creation with little scale beads, a pretty dark and light blue crystal necklace, perfect to pair with your favourite jeans! Next up, small sea shells and furry cord are combined for a new and different texture. The stunning turquoise and purple glass pearl necklace features two three different sizes of pearl for a crescendo in size, and unfortunately sold at our last party! The next uses two different sizes of hematite discs for a unique shape, followed by a green pearl and snowflake obsidian piece with ball chain adornment. Speaking of semi-precious stones, the second last is a gorgeous polished stone piece with a stunning focal, and the last is a fun and funky pink stone and hematite creation with a large focal! One technique, SO MANY possible variations! You'll have to come see us at Pop Expo to see what else she's come up with since this shoot! Oh, and to keep up with Meghan's new work on a weekly basis, check out her Facebook page at https://www.facebook.com/MissMagoozJewellery! Until next time!